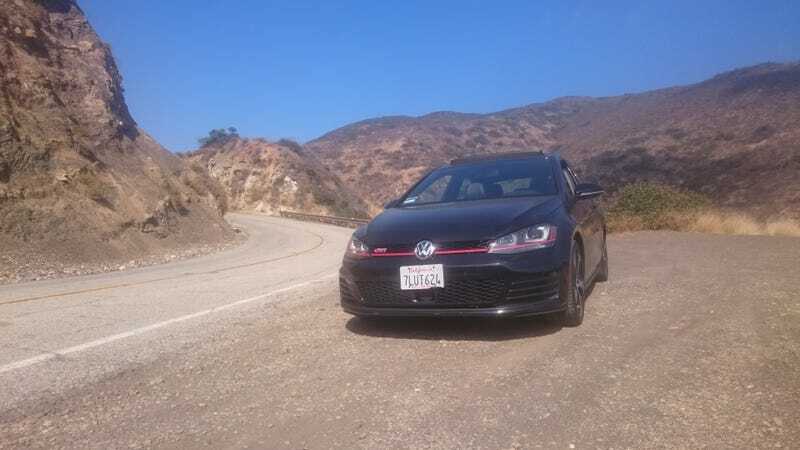 This weekend I had a 2015 VW GTI as a Turo rental for my move into a new apartment. It was an excellent vehicle and other than the ‘12 MCS I drove, this was my first experience with a hot hatch. Well it definitely fit the bill of being fun and practical. First, I was able to fit all of my wordly possesions that I could fit into 5 suitcases with 50 pounds each in addition to a few other bags. Then, some home depot and other stores to pick up building materials for new shelves and bed frame stuff. And after doing all of that, some spirited driving through the Santa Monica mountains and down to Malibu. Somehow I could still see out of the back and totally could have fit at least another full suitcase or two, plus the front passenger seat for more. The only complaint I had with this car was just that it was too quiet. The exhuast and turbo noises were definitely there but even with the windows down and full throttle, it was barely a whisper. Certainly quieter than my Miata with the stock exhaust and damn near silent compared to the aftermarket stuff. Also, torque steer. While I imagine it being more pronounced in other high power FWD cars, it was definitely there on heavy throttle in first gear. But in general, I was enjoying cruising around in traffic operating the super easy clutch, sitting in the super comfy seats, and blasting down the 101 every time traffic cleared up. However, once I took this car into the mountains, I was reminded how this is also a wonderful chassis built for the fun stuff. This is what sold me on the car and made it a true contender for my next vehicle. I think with an exhaust, some summer tires, and maybe a mild tune, I would be set with one of these. I’d want to get an older one, probably a mk6. But I am extremely worried about a maintenance nightmare. This car had no issues but it is basically a new car. I could see myself enjoying one either way though. The seats truly were some of the best I’ve sat in, balancing proper bolstering support as well as sublime comfort. And I felt the same way about the steering and suspension sporty/comfort balance. So how does it compare to other cars I am interested in? It was a bit more comfortable and practical than the Mini Cooper but it also didnt handle as well and was slower in a straight line. I think the MCS gets my vote for favorite hot hatch so far, but just barely. Still to try will be the WRX, MS3, and FOST. I think I am definitely sold on some sort of hot hatch though for my next car to go along with the Miata. It was just so practical for all of my moving needs but also was fun in completely different ways. Yeah it was fail wheel drive which I noticed through understeer in the canyons and torque steer on local streets, but thats why it is different fun.